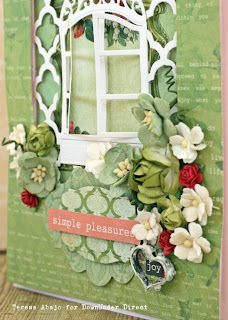 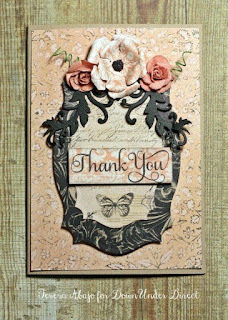 The Grateful Lattice die cut reminded me of garden trellis, hence the abundance of flowers. 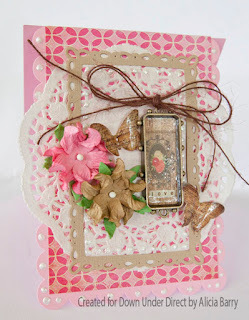 Today we have another off the page project to share with you. 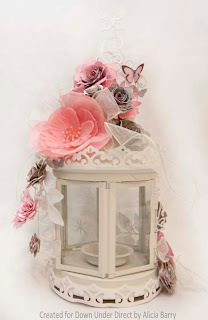 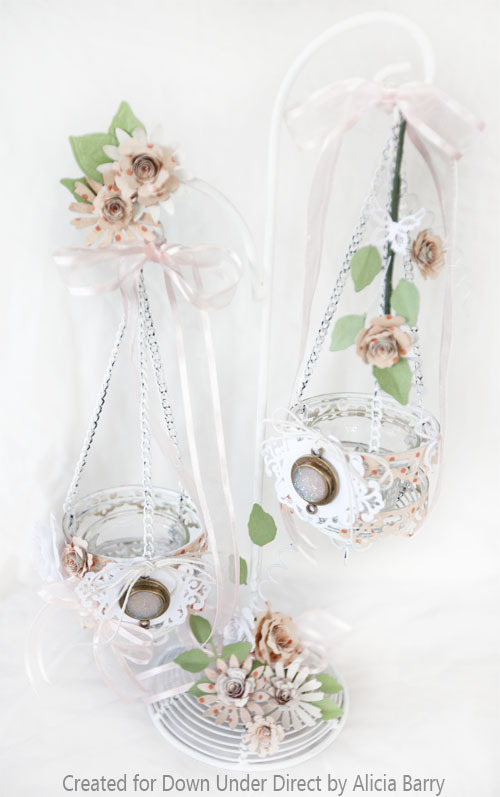 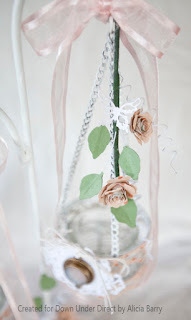 Here is a lovely idea to decorate a tea light holder. 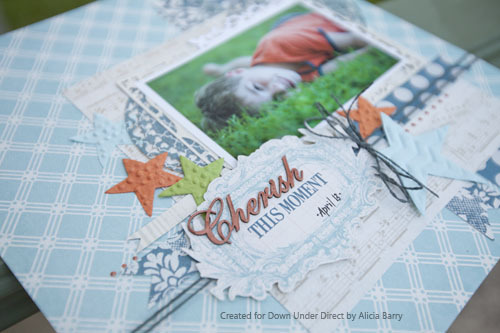 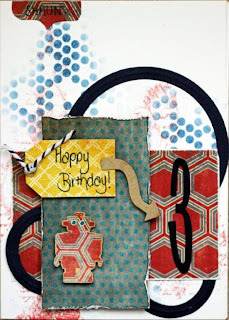 Today Beck demonstrates how to use your dies to work in with elements in a patterned paper with this quick tutorial. Look at the elements in a paper and see if a die might work in well with it. I love to grunge up the back ground on the plain cardstock for a more masculine feel. 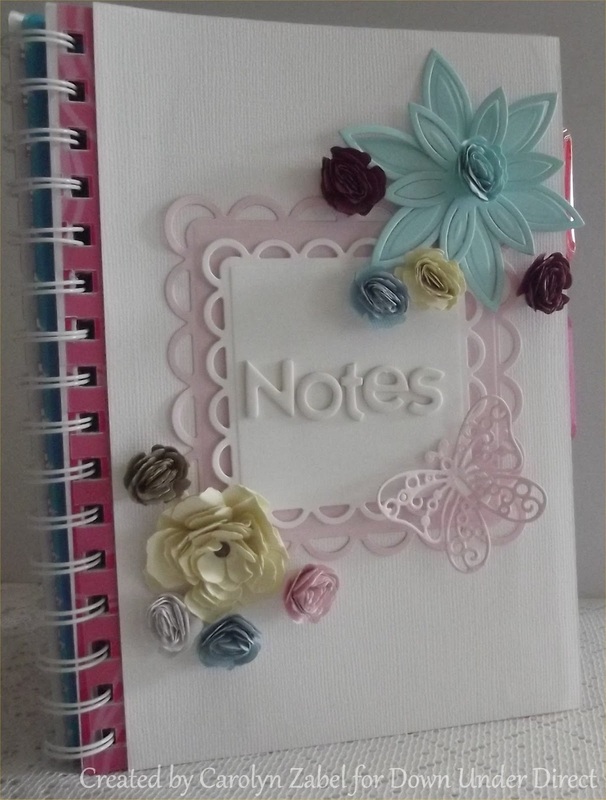 Worked really well with this paper range as well. 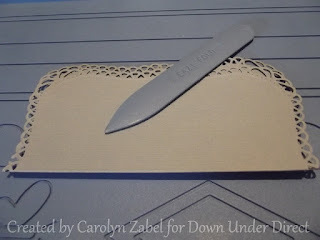 I love that Le Crystelle produce pre-cut, pre-scored cards especially when it comes time to make a batch of invitations. 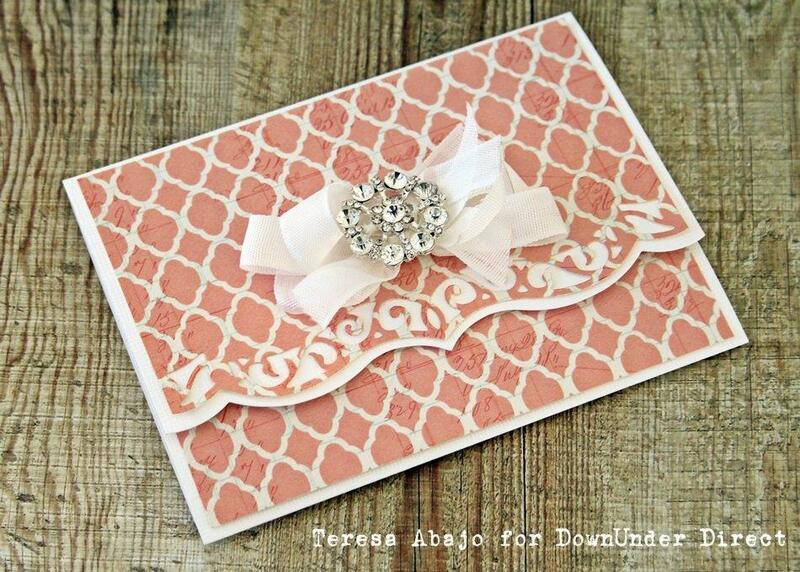 Here's an idea for a simple yet elegant wedding invitation. I stamped the lace image in the background of the removable insert card. 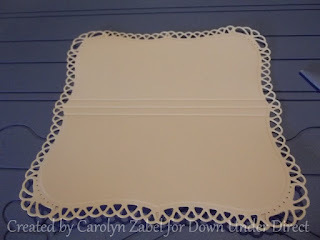 The information would be printed over the top in rich black ink. Good morning everyone. 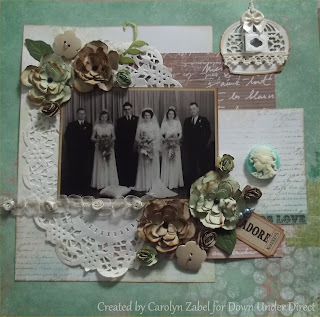 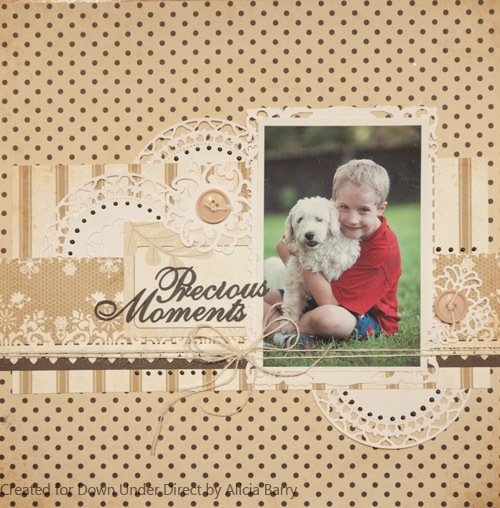 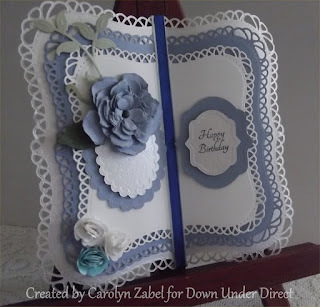 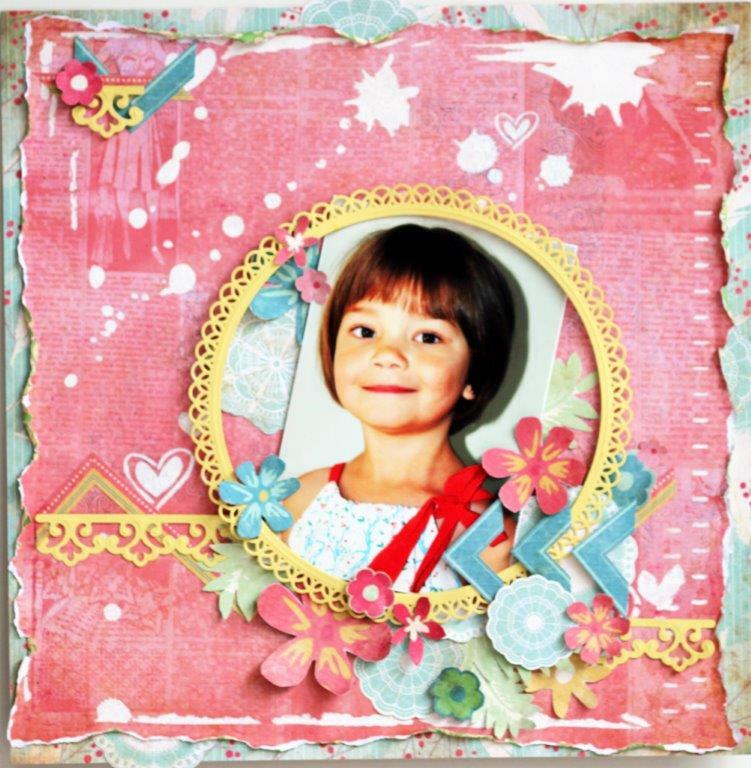 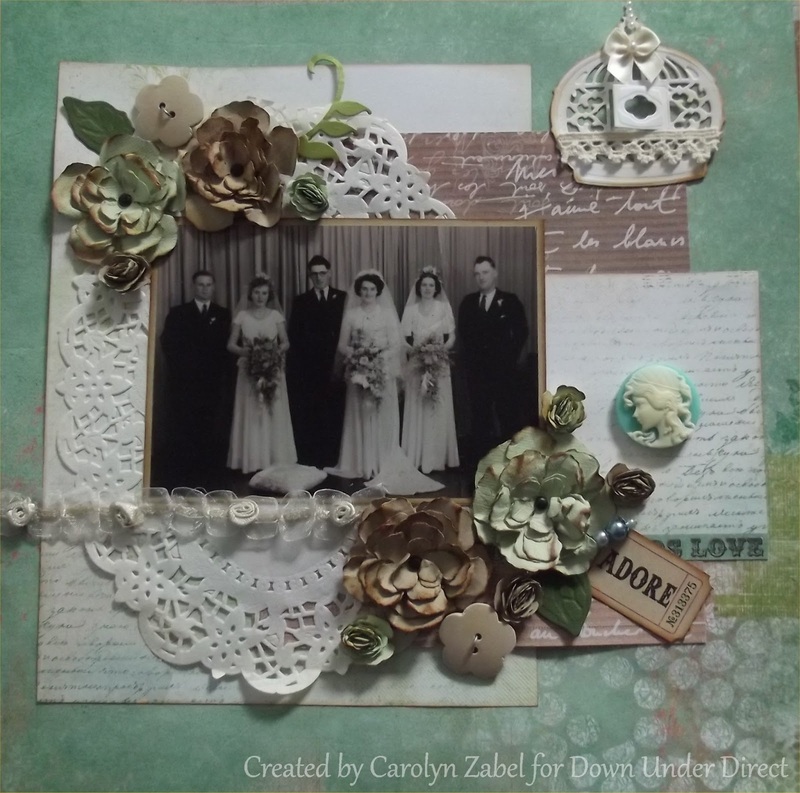 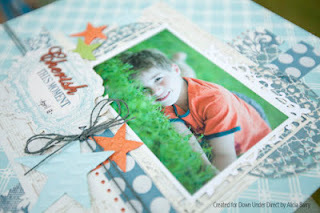 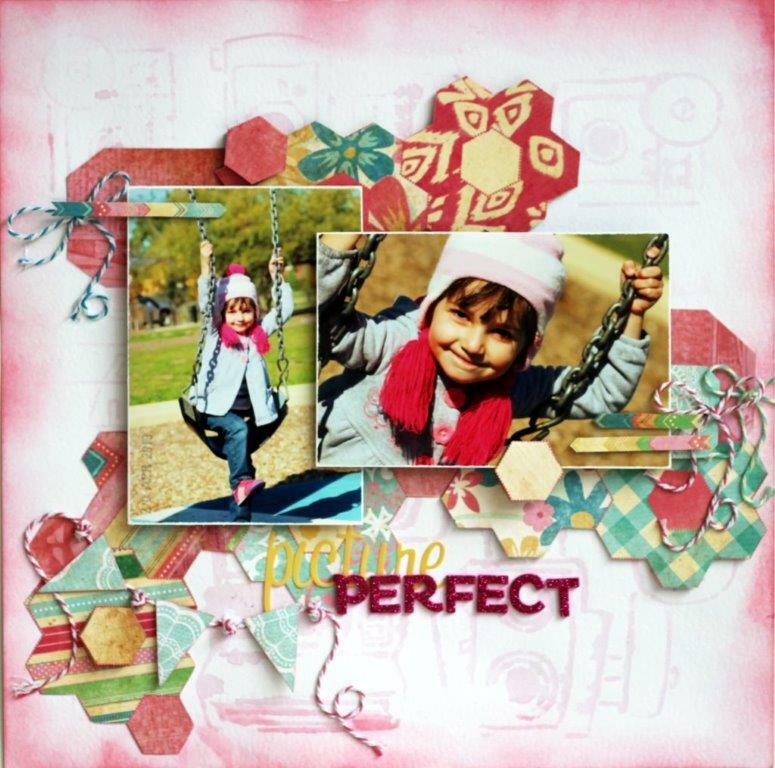 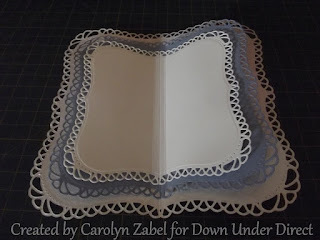 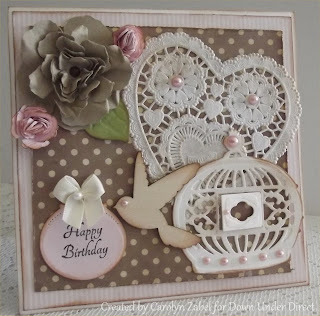 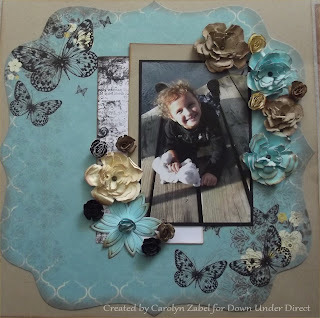 I've an early morning post of this cute layout from Carolyn. 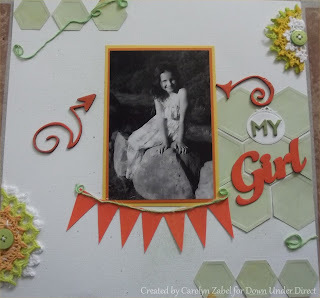 I'll be back later with another project to share. 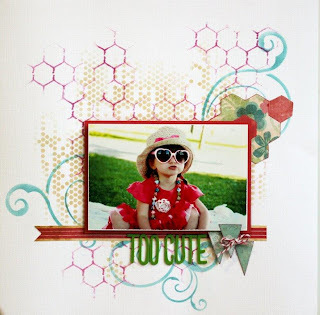 Using shapes as your main focus of embellishing the page is a lot of fun. 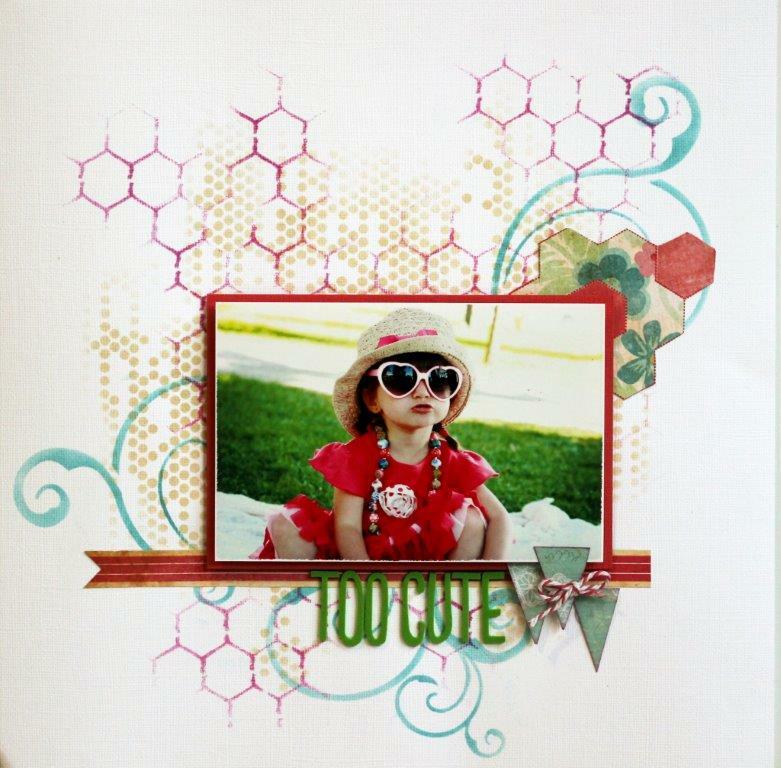 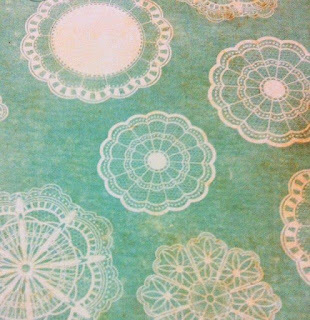 Make your own backgrounds on white cardstock using a stencil to compliment the patterned paper colour scheme and photos on your layout. 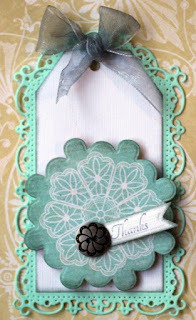 Today we have a pretty easel card to share with you. 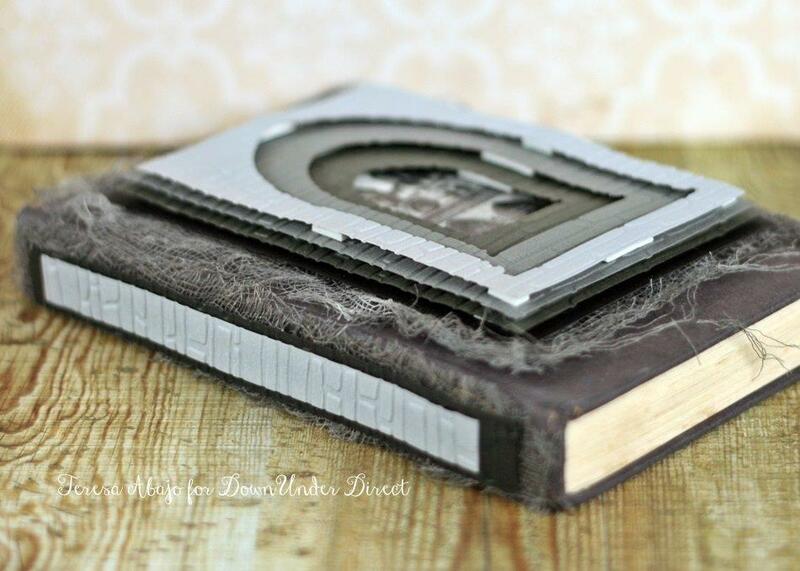 I wanted to alter this old book, so I thought I'd start with the cover. 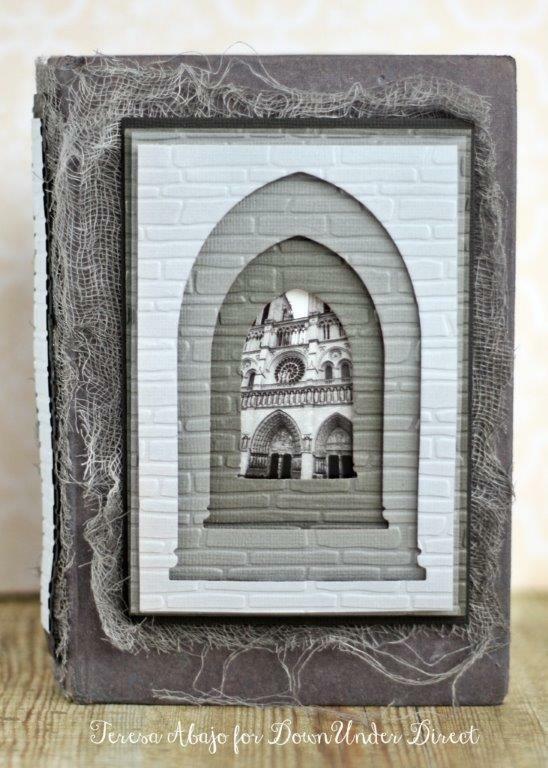 The new Arched Windows One dies perfectly suited the gothic theme I was going for. 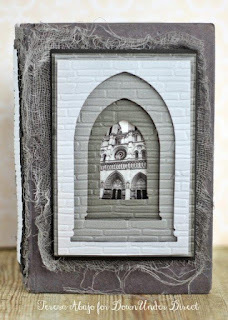 I layered three different sized arches over a photo of Notre Dame cathedral. For effect, I embossed each layer to make them looked bricked. 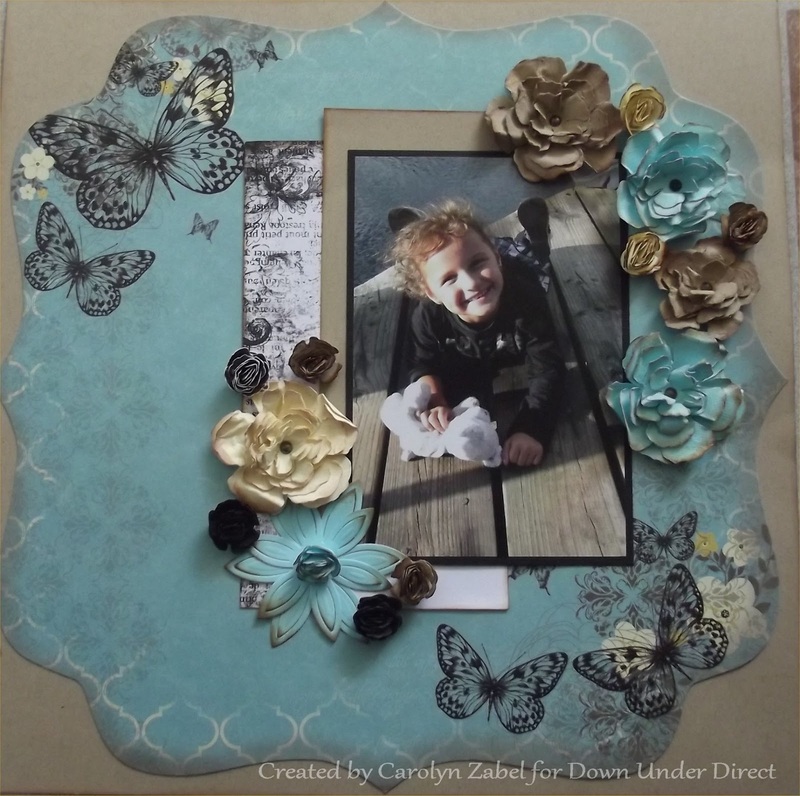 The new Media Mixage dies needn't just be used with the accompanying bezels. 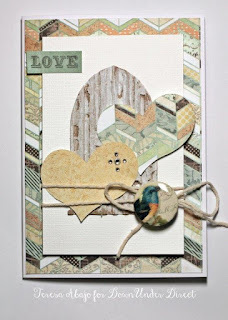 I've fallen in love with this heart shape, and made a modern wedding card with two hearts. 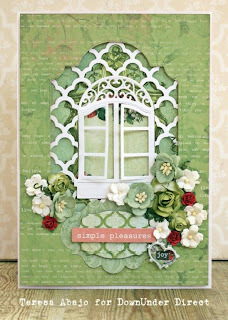 Today we have a layout featuring one of the new Die D'Lites - Birdcage One. 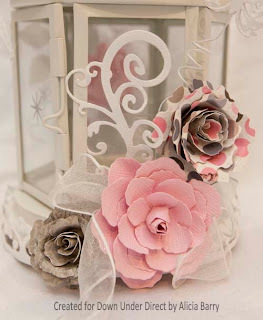 I'm only just discovering how versatile the Rose Creations dies really are! They can make a variety of flowers, not just roses. This started out as a really ugly black steel with brown beads candle holder. 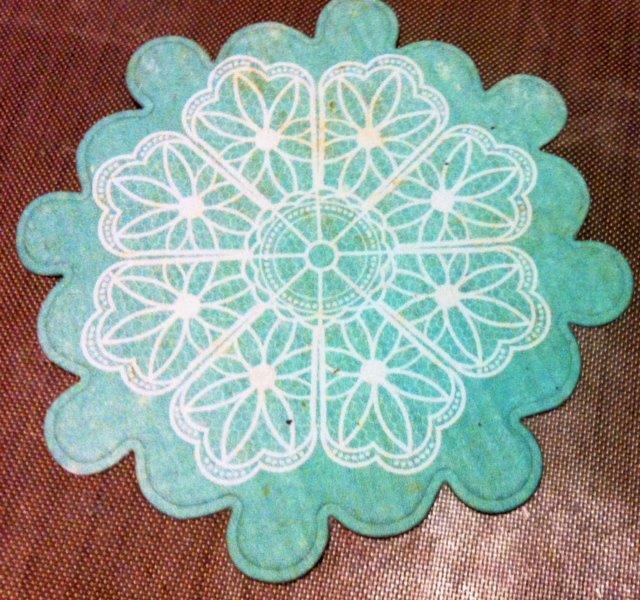 I removed the beads and applied gesso to the whole thing to lighten it up. 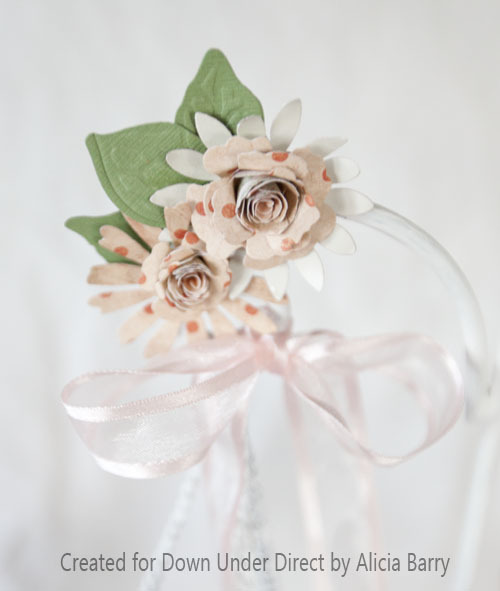 It has hand made paper vines with lots of handmade flowers. 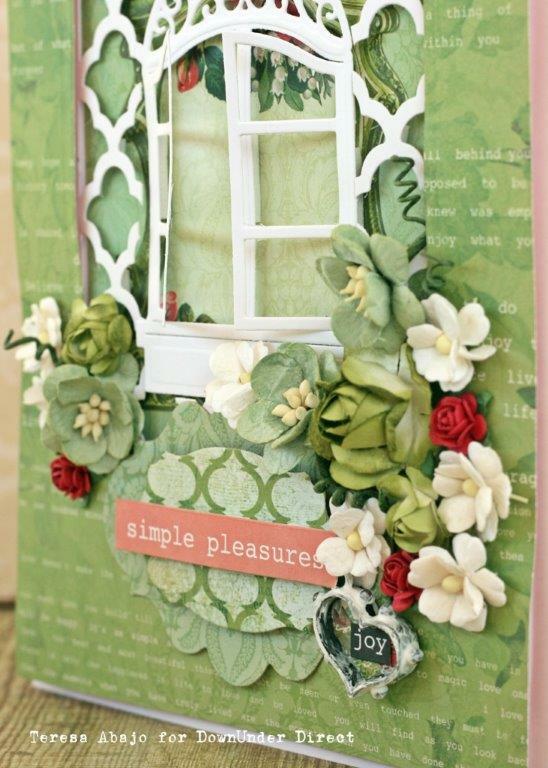 Welcome to Tutorial Tuesday. Today we have a book card to share with you. 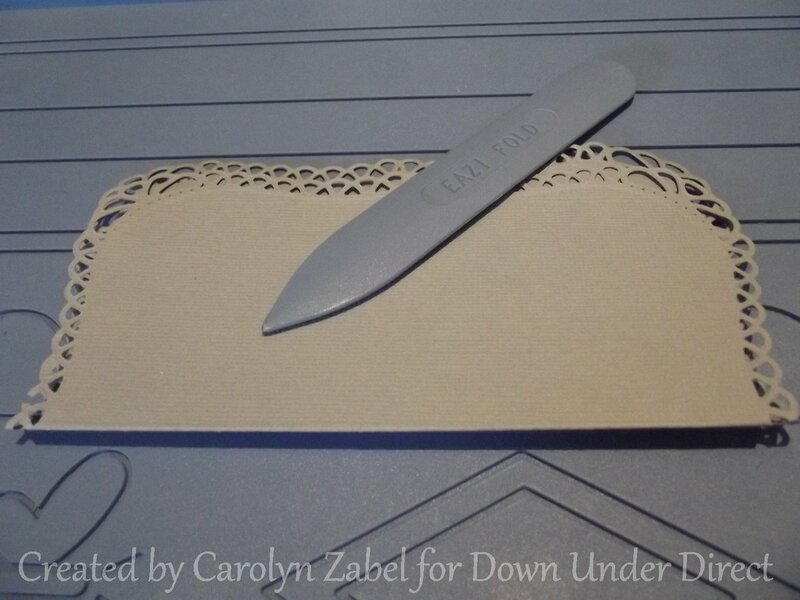 Cut out 3 descending dies from the Grand decorative labels one also emboss them. 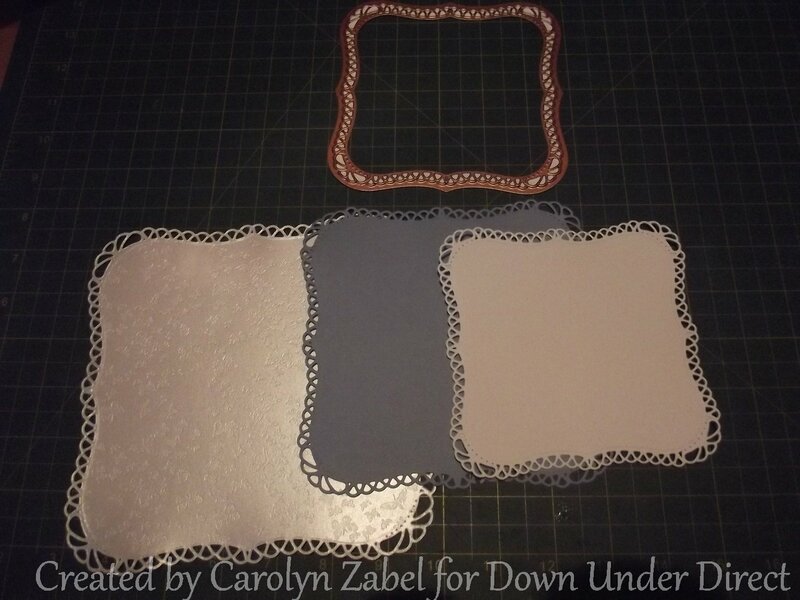 I chose 3 complimentary colours. I did not use the largest size but used the next 3 down. Score in the middle of the die-cut to make it look like 2 pages from a book. 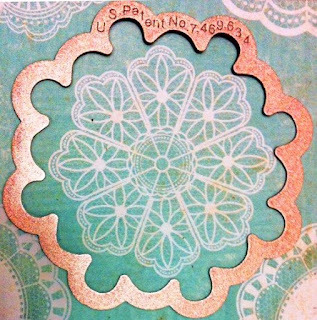 Its easy to work out the centre line the die-cut rises up a bit at the top. 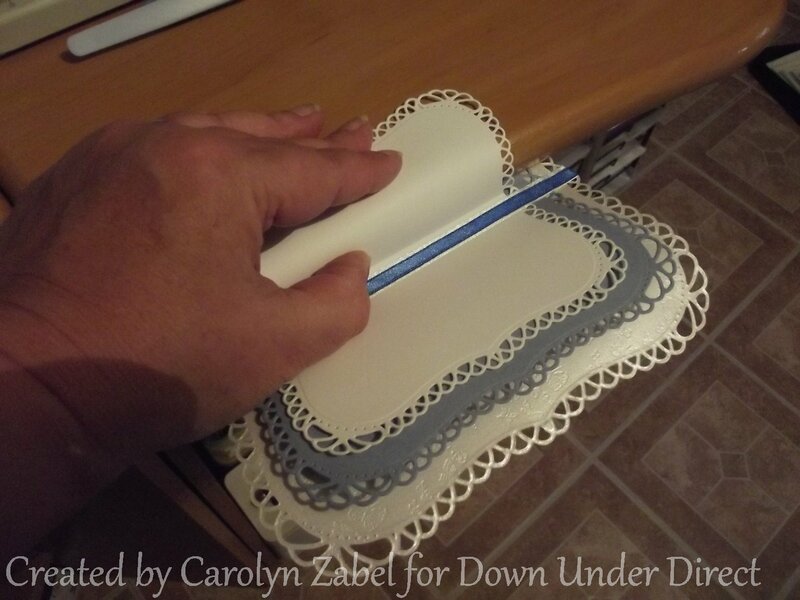 I then scored a line each side of that score line about ½ a cm away from your centre line. Fold these lines you just scored. 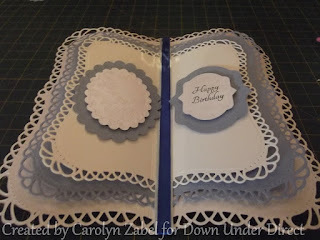 It will give the appearance of an open book. 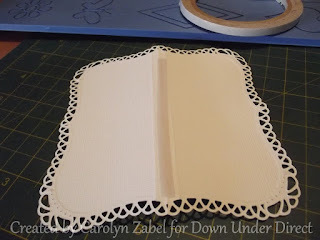 I didn't work this out till later, but its a good tip if you hold the individual pages on the edge of a desk or table and roll the paper down over the edge it will give a curve to the page thus helping it look like an open book. 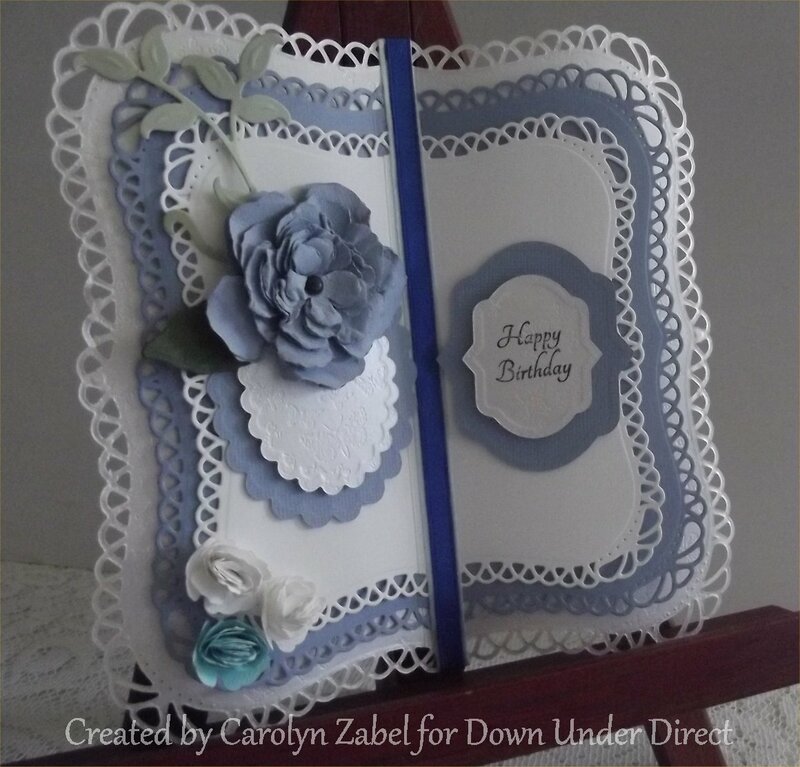 Using double sided tape or glue run down the first score line we made on the back of the 2 smaller die cuts and adhere the second largest to the front of the largest die cut and so forth till your 3 book pages are joined together. 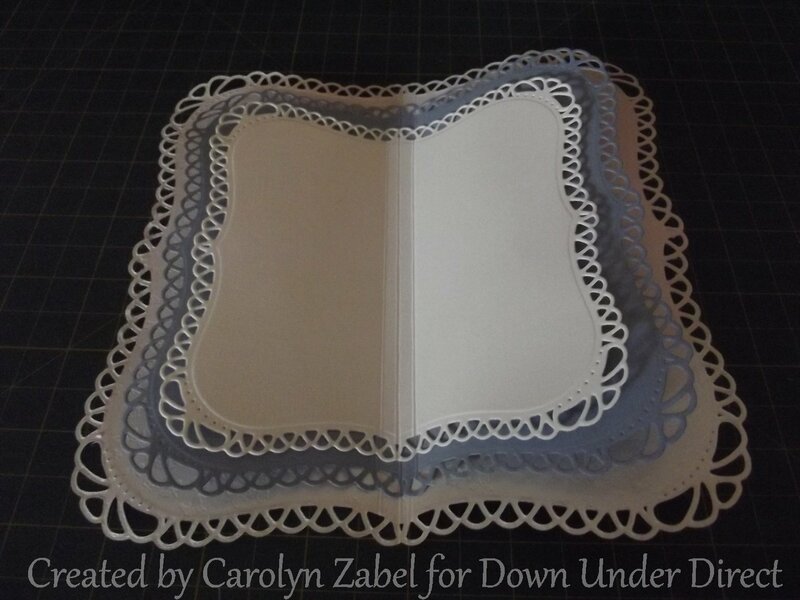 Our book card is coming together now. 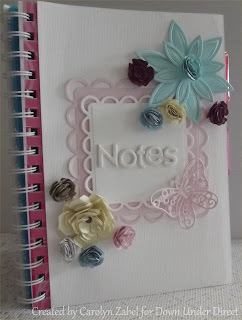 Now choose 2 complimentary ribbons not to thick one a little thinner then the other now add this to the centre front of your book, the widest one first and then the thinner one right over the top. 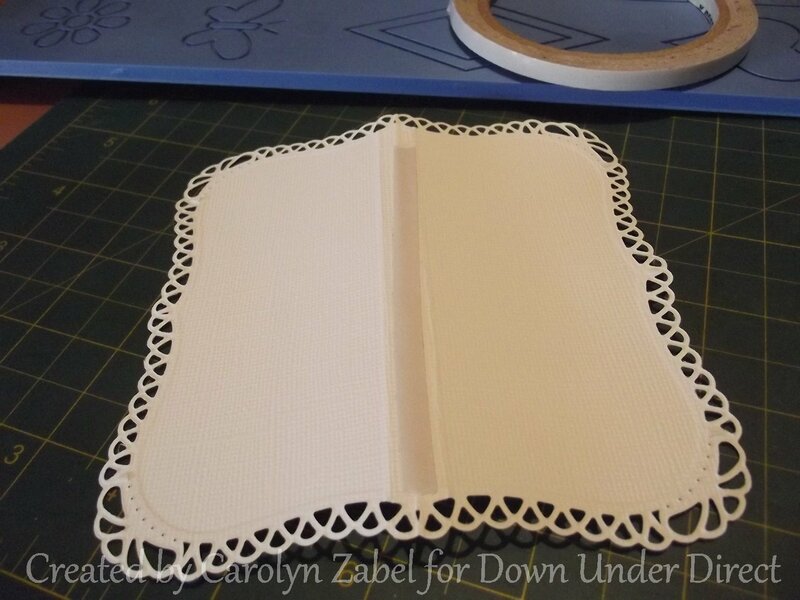 Now we get to the really fun part. Decorate to your own tastes I used the scalloped ovals on the left side and the nested oval medallions on the right for the sentiment with the lovely Happy Birthday stamp from the Always and forever medallion labels. 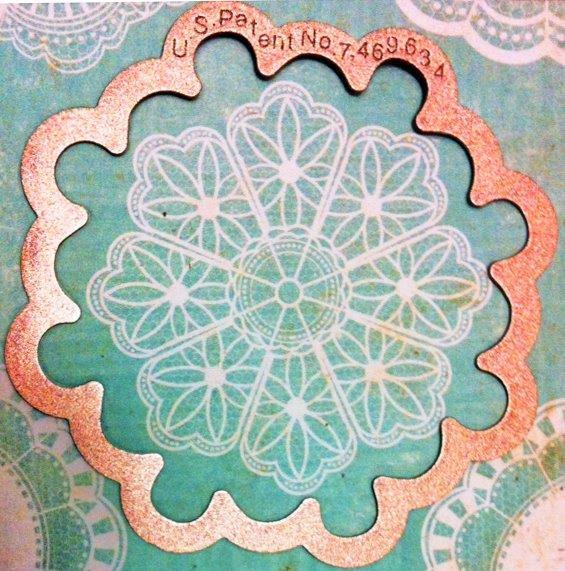 Then some flower die cuts to finish it off. 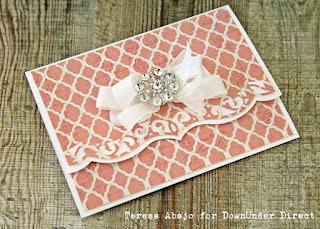 Today we have a simple little OTP to share with you today. 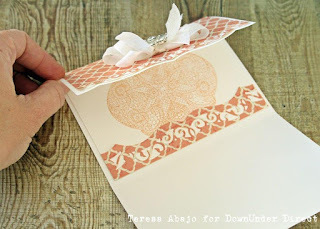 A lovely idea to give instead of a card. 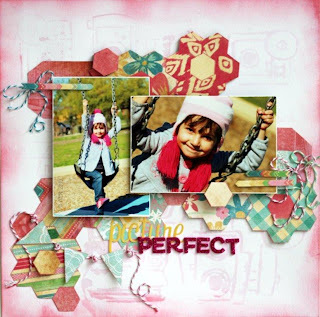 Today we have two lovely layouts from Beck. The cardstock that comes in the patterned paper collections teams up perfectly with the patterns in the paper, I used the yellow plain cardstock to make the Spellbinders Die cut elements stand out. We took the children to their first ANZAC day dawn service and parade in Melbourne. This is a photo of Elouise proudly wearing her poppy. 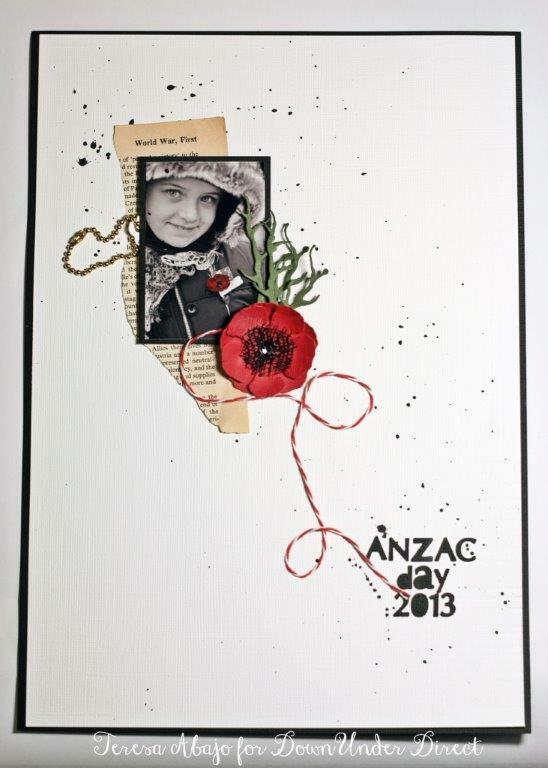 I printed the photo in black and white and coloured the poppy with a Distress Marker to highlight it a little. 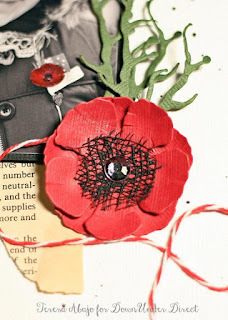 I also made my own poppy using the very versatile Rose Creations dies. 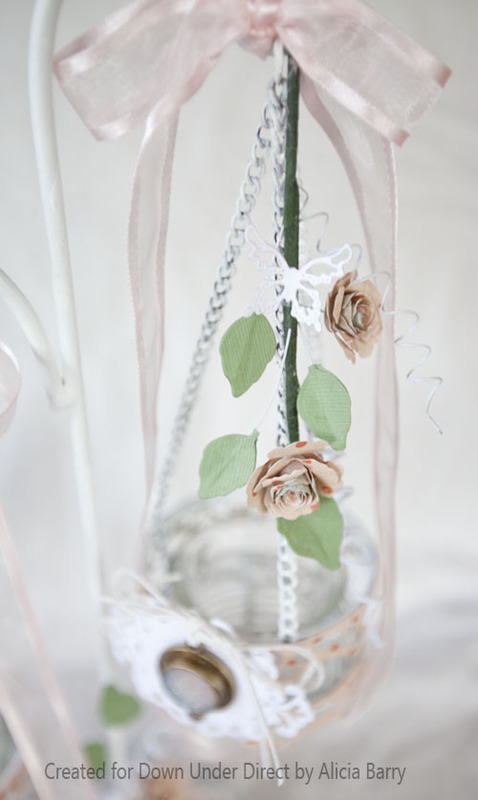 The green twiggy foliage represents the rosemary that is used for remembrance. 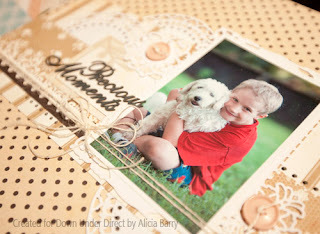 The red and white twine serves to link the photo area with the title at the bottom of the page. 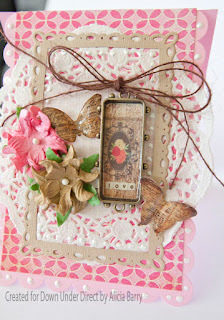 In keeping with the army theme, I added some hidden journaling on some tags to look like dog tags, and a piece of old page torn from a history book about the First World War. Here is a pretty card using some of the Media Mixage elements. 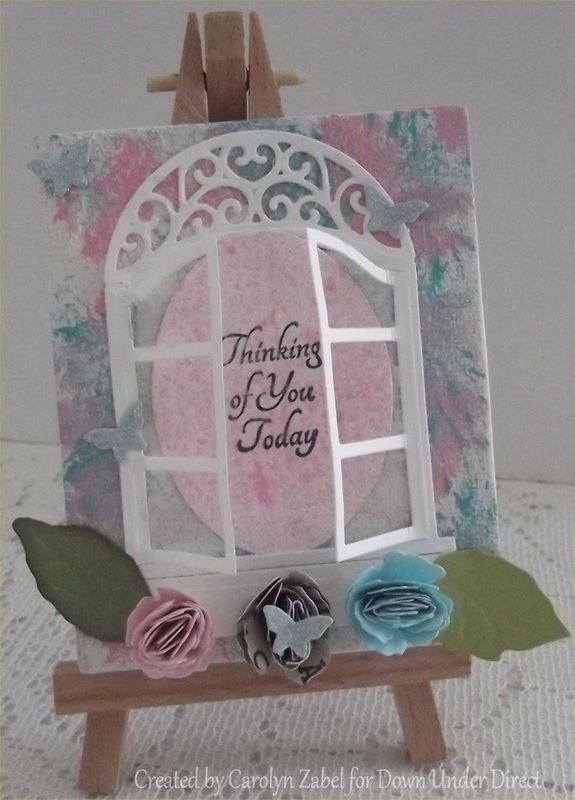 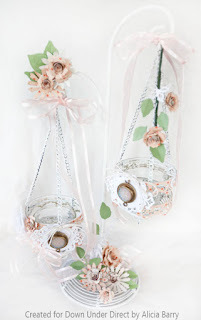 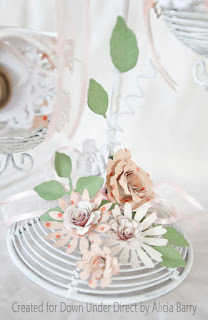 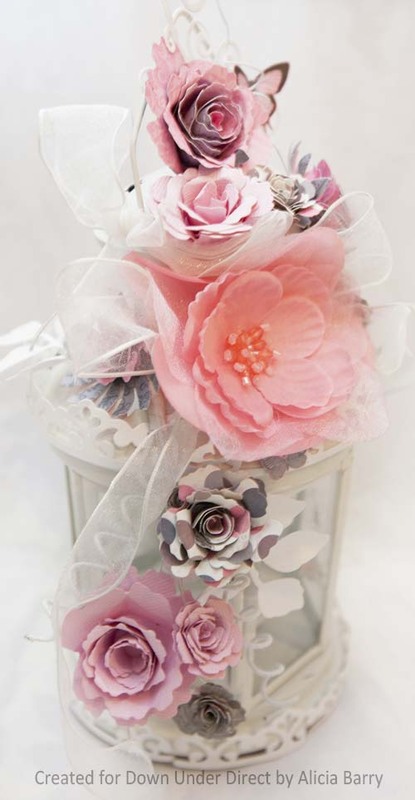 Amazing results can be created using a few different flower dies to embellish pages. 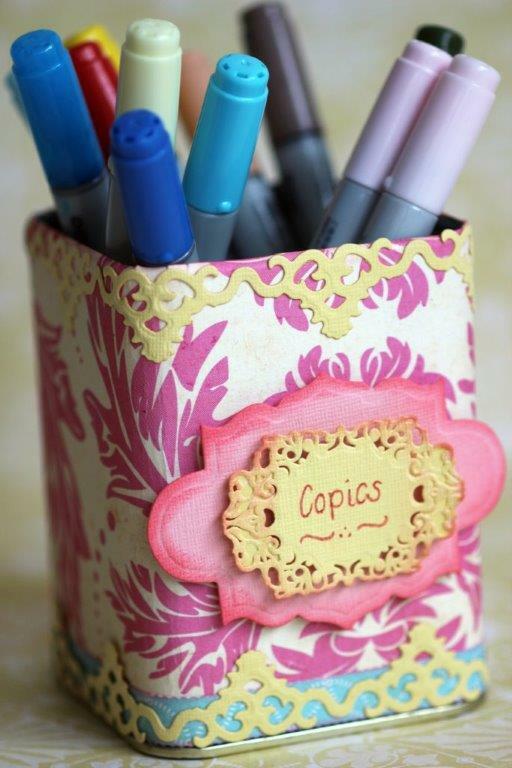 Today we have a pretty storage idea.